Plants grown for their foliage only can give color to a shady area in the garden. This container combination in purple and green is understated yet elegant. Purple shamrock (Oxalis) is often times grown as a houseplant, but the plant can be moved outdoors and will grow happily in a part shade area. Oxalis will go into dormancy if under watered or in the hottest part of the summer. Make sure you water it regularly. As a focal point in this container, Cordyline is the vertical accent that ties the combination together. There are many varieties available for purchase, and they all prefer to grow in moist potting mix with good drainage, warm temperatures and part shade to shade. They only require occasional fertilizing with a formula for houseplants (high in nitrogen). Asparagus fern is also a shade loving indoor plant that can be grown outdoors during the summer months. 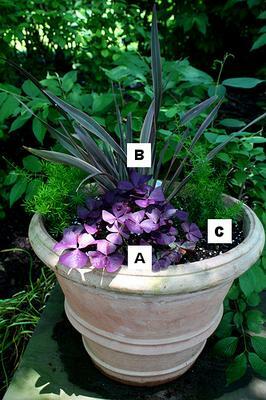 Maintain the potting mix moist, since plants will get stressed and yellow if they are over or under watered. It doesn't really require much fertilizing, but it will benefit from a monthly application of all purpose or houseplant formula. Get inspired by dozens of container garden ideas, and turn your garden, front yard, patio or rooftop into a paradise!